The Mizu VoIP tunneling solution is a set of client and server side software, developed in order to enable making VoIP phone calls for: users in VoIP blocked countries, users from behind firewalls or users who need encrypted VoIP communication. Using our solution users will be able to make and receive calls to/from blocked countries from any PC (via Windows softphone, webSIPphone), mobile phone (Android and iPhone softphone), third-party softphones (using the client tunnel) or from any other VoIP devices: ATAs, IP phones(using the client service). We are a VoIP software and service provider company with over a decade experience. Whether you are just getting starting in the VoIP industry or you are an experienced VoIP provider we can offer for you a managed VoIP tunneling solution. One of the our most important partner is Mizutech, which is a VoIP software developer company with large experience in telecommunication. The Mizu VoIP Tunnel is our flagship product for which we offer support and maintenance services. Our clients benefits of a trial period. In the trial period our team members will provide trainings via Skype and remote desktop about our services. The Mizu VoIP encryption solution is a set of client and server side software, developed in order to enable making VoIP phone calls for: users in VoIP blocked countries, users from behind firewalls or users who need encrypted VoIP communication. The VoIP communication is blocked in numerous countries by the ISPs (Internet service provider), Telco's in order to prevent competition, so the users are forced to use their VoIP services or the PSTN (Public switched telephone network) services. Mizu VoIP tunneling solution will allow VoIP communication usage in any country avoiding VoIP filtering, it is suited for ITSPs, carriers, wholesalers etc. Using our solution users will be able to make and receive calls to/from blocked countries from any PC (via Windows softphone, webSIPphone), mobile phone (Android and iPhone softphone), third-party softphones (using the client tunnel) or from any other VoIP devices: ATAs, IP phones(using the client service). Get excellent voice quality without any network overhead or delay. The Mizu VoIP Tunnel doesn't require any special hardware equipment, neither network or firewall modifications. The Mizu VoIP Tunnel was optimized for Microsoft Windows OS with a MS-SQL backend. All administration tasks can be done using the MManage (MizuManage) client application. The main module is automatically installed with the tunnel server installer, but you can also install it independently to any PC and manage your tunnel server remotely. 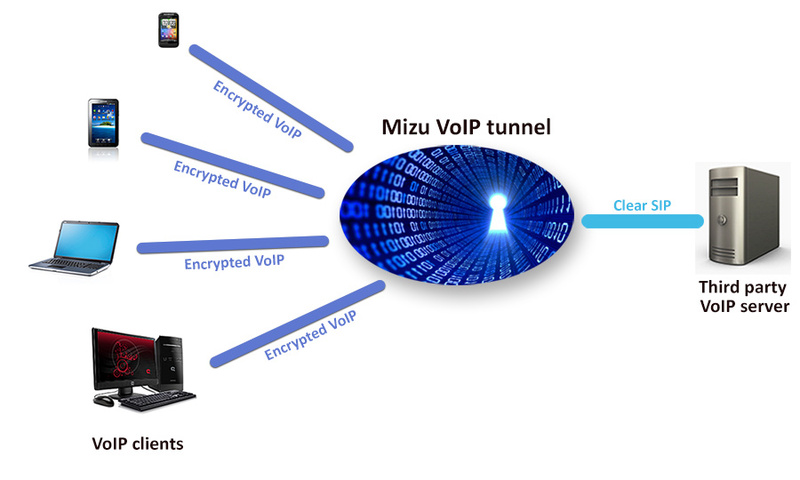 Mizu VoIP tunneling solution use 12 different transport method, using UDP, TCP or HTTP protocols to bypass all firewalls. Mizu tunnel server is running over a full featured class 4/5 SIP stack with the following functions: voice calls, video calls, presence, IM, DTMF methods, PBX functions like call hold, transfer, conference etc. and support the commonly used codecs: G729, PCMA, PCMU, G723, GSM, Speex, Speex WB, iLBC ect. public-key cryptosystem and is yet widely used for secure data transmission.